Islam is not a monolith. 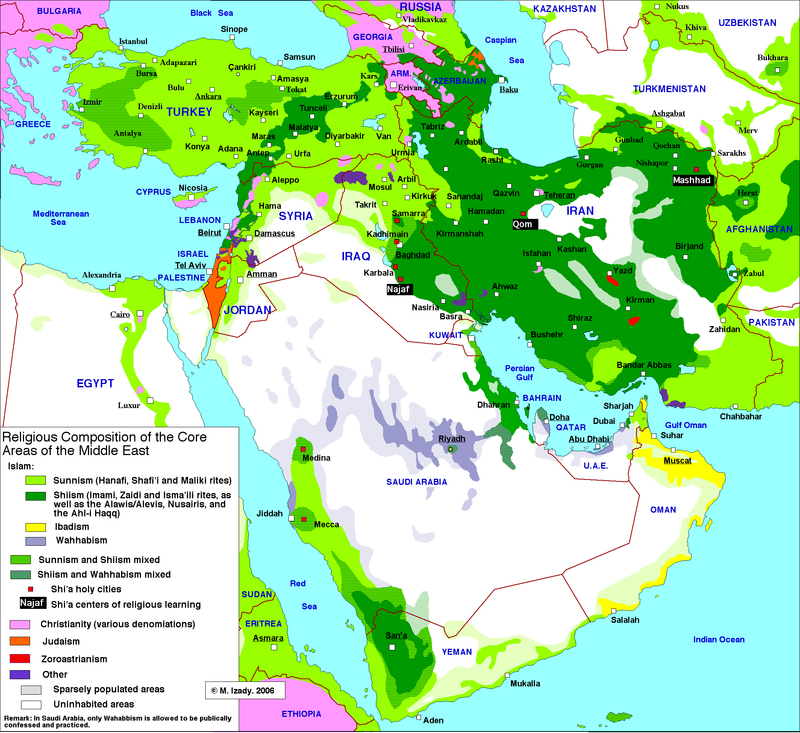 Sunni and Shia Islam are the two main denominations of the religion divided by major differences. Within the two, there are many branches and various types of schools with, sometimes, even bigger differences to separate them. The debates between Sunnis and Shiites has always existed but there was a particular kind of balance between the two. The confrontations flared only when attempts to tip this balance took place. The national divisions have exacerbated the religious strife. The Arabs and the Turks have vied for dominance inside the Sunni denomination. Iran (Persia) has been traditionally dominant inside the Shia branch of Islam. The other reason for tensions intensification has always been interference from the outside. The West believes that in recent years Iran has been responsible for the instability in the region. After the Islamic revolution of 1979, Iran has been consistently expanding its influence provoking Sunni neighbors, especially Saudi Arabia, into taking countermeasures. The West cites the Shia government in Iraq, the Iranian volunteers operating in Syria and the advance of Yemeni Houthis (Shia Zeidis) in the south of Arabian Desert as examples to prove the point. An impartial assessment shows that the current instability in the Middle East is mainly provoked by outside forces. Suffice it to say that Ayatollah Ruhollah Khomeini, the leader of Iranian revolution, insisted the movement was Islamic, not Shia only. He instilled a policy of «takrib», meaning the bringing together of sects, and he accordingly abolished prohibitions concerning praying behind a religious leader from another sect. It was not Iran who tipped the balance, but the United States as it intervened in Iraq in 2003 to overthrow Saddam Hussein, a Sunni Muslim. The Shia majority came to power in Baghdad as a result of US meddling, not the «intrigues of insidious Persians». After the intervention, Washington started to instigate the Persian Gulf states concern over the «Iran’s growing ambitions». The monarchies say they defend themselves from the «Persian expansion» by intervening into Syria and Yemen though, obviously, these actions, as well as the execution of Nimr al-Nimra, a prominent Shiite Muslim cleric, by Saudi Arabia, make Tehran take retaliatory measures. The United States sided with Sunni Muslims by chance. Washington easily changes allies pursuing its own unchanging interests. Everything could be quite different if, for instance, the Iranian monarchy remained in power and the leftist regimes still ruled in Baghdad, Cairo and Damascus. It all may change along with the course of history. Some Western Orientalists say that the Shia branch of Islam is «a dissident movement», which is closer to the Western ideas than the «hegemonic Sunnah». The West chose Sunni Muslims pursuing its «oil and other interests». The US Presidential Study Directive-11, or PSD-11, produced in 2011 outlined administration support for political reform in the Middle East and North Africa and launched the Operation Arab Spring to strengthen the US clout in the region. Taking advantage of existing Sunni-Shia contradictions was an important element of this concept. It is evident today that the Obama’s Middle East policy has failed to bring democratic changes to the Middle East. Instead, the region has plunged into chaos. In an effort to save face Washington pretends to control the situation. It is playing the Shia threat card. The United States has ceased the calls for «liberal reforms» implemented in Sunni monarchies. The White House fully sides with them, especially with the Saudi royal family, in their confrontation with Iran. It brings results. Only a while ago the Saudis could not hide their exasperation with the US-inspired «Arab Spring» (some said there was a split in the relationship between the United States and Saudi Arabia). Now the Kingdom views the United States of America as the main ally again. This comeback could be viewed as a success of the United States incumbent administration in comparison with its past failures. But the situation is fraught with danger for the Middle East with a religious war looming at the horizon. When it comes to assessing the balance of forces, experts normally say that among the world's estimated 1.2 billion Muslims, about 85 percent are Sunni and about 15 percent are Shiite. These figures are not enough to make a clear picture of the balance. About 50 percent (out of 85 percent) of Sunni Muslims live far from the region where the direct confrontation takes place. For instance, many reside in South, South-East and Central Asia (Indonesia, Pakistan, Bangladesh, Malaysia, Uzbekistan etc.). They are not eager to get involved into the sectarian violence. At least half of the remaining 35 percent live in Africa. They can hardly be viewed as possible reinforcements for Riyadh. Only about 20 percent of Muslims in the world live in Arab states. It makes the correlation of Sunni-Shia forces in the Middle East almost balanced. Sunni Muslims makes up 98 percent of population in Iran, 75 percent in Bahrain, 54 percent in Iraq, 45 percent in Yemen, 30 percent in Lebanon, 27 percent in the United Arab Emirates, 25 percent in Kuwait, 20 percent in Qatar, 20 percent (including Alawites) in Syria and 10 percent in Saudi Arabia. Saudi Arabia boasts a huge arsenal of US-supplied cutting edge weapons. But it is far from being a decisive factor. Training and morale are also important. The poorly equipped Yemeni Houthis down aircraft, sink ships and even seize military facilities of the kingdom’s armed forces in the south of Saudi Arabia. Adding a new front in the north to fight Iran would not be a good strategy under the circumstances. The fate of oil wells in the eastern part of the country is a matter of concern for Saudi Arabia too as these areas are mainly populated by oppressed and marginalized Shiites. The kingdom used force to quell unrest in provincial areas. The threat of revolt remains to be real. «The kingdom faces a potentially perfect storm of low oil income, open-ended war in Yemen, terrorist threats from multiple directions and an intensifying regional rivalry with its nemesis, Iran», says Bruce Riedel, a former senior CIA officer with long experience in the region. The Islamic State is doomed to suffer a defeat in Iraq and Syria. The question is, where will it go retreating? It’s quite possible it will move to Saudi Arabia in an attempt to make it a springboard for future operations. There is a slim chance the militaries of Syria and Iraq will pursue them crossing the territory of another state. Perhaps, Riyadh has announced the creation of «Islamic coalition» to fight the Islamic State terrorist group, as well as its readiness to conduct combat operations on the territory of Iraq, to prevent the invasion of Saudi Arabia’s territory by jihadists. It’s hard to imagine Baghdad giving consent to Saudi operations on its land as it is witnesses the Riyadh’s anti-Shiite campaign. The fiasco suffered by Turkish troops entering Iraqi territory is a good example to prove the point. By intensifying the confrontation with Iran, Saudi Arabia is unleashing a war it cannot win. In addition, it deprived itself of the neighboring states’ support while facing the returning boomerang it had thrown – the Islamic State. The hopes pinned on the support of the United States, especially boots on the ground, may be dashed. The United States is not inclined to get mired in military adventures during the election year. In this context The Wall Street Journal has made a rather strange statement. It affirms in an article that «Iran and Russia have an interest in toppling the House of Saud, and they may be calculating whether President Obama would do anything to stop them». This statement offers no evidence to go upon. Moscow and Tehran strongly oppose the changes in the regional balance of power, while Washington has been doing its best during the recent 12 years to make the Middle East region, including Saudi Arabia, its close ally, face the explosive situation. The famous Latin phrase comes to mind: Qui prodest? Who stands to gain? Are we witnessing the final act of the play called «The Arab Spring» written by an artful author, which tells a story of all the Middle East governments toppled, including the house of Saudis, which is not aware of what’s taking place? And what then? Will a new Middle East appear out of the ruins to meet the aspirations of the scriptwriter? Will the plans succeed?